Well 30 straight days of blogging out of 31 isn’t bad. Let’s finish up out bindings! OK so once you have made it through step 10, our next step is to join the binding. 11) We are dealing with the 10-12” gap we left in the binding. Pull the binding taught so that the binding meets in the middle of your “gap.” You’ll want it to be pretty taught if it’s loose you’ll end up with puckers in your binding. Once your binding meets in the middle fold back the tails onto the binding leaving a small gap (about 1/16”.) Finger press hard down the width of the binding. You’ll need to be able to see those creases in the next step. The reason for that little 1/16” gap is that it will account for the stretchiness of the fabric. Just trust me, it’ll turn out perfect in the end. 12) For the this step I always position my quilt as shown (with the raw edges up away from me) so that I don’t end up with a twist in my binding. Every once in a while I still end up with a twist! Take the tail on your left and open it up with the “right side” of the fabric facing up. 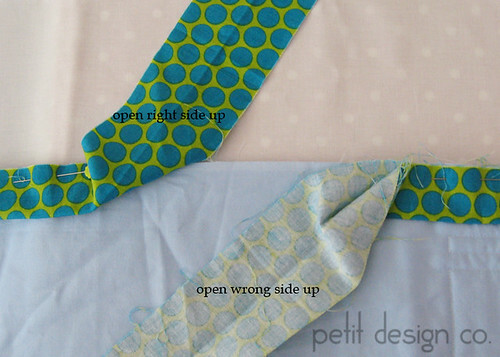 Take the tail on your right and open it up with the “wrong side” of the fabric facing up. 13) You can mark your centers where your fold lines, or creases, meet. You can use a pencil. I used a red Frixion pen and marked as lightly as possible. 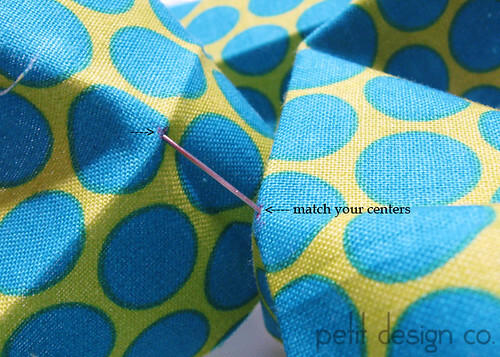 14) Now you will match the centers with a pin with “right sides” facing each other. Push the pin through the “wrong side” for the tail on the right, and through the “right side” through the tail on the left. 15) Keeping the pin through your center mark you are going to pin the tails in place at so that they are perpendicular to each other (form a cross.) You should have a “t” or “cross” on each of your binding tails, from when you finger pressed, to help you align the tails so that they are perpendicular. Use additional pins to secure in place. 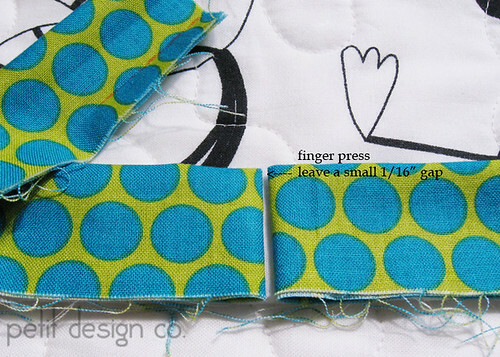 Using a quilting ruler, mark a 45° stitching line. This stitching line starts and stops at the corners where my tow tails meet. Now fold the binding back into place to make sure everything worked out all right. Double check to make sure the binding is not twisted, too long, or too short. It should lay nicely along the edge of the quilt. If something is “off” unpick, and try again. There are times when I’ve had to unpick twice – binding while tired is not a good combination for me! 16) Once you are satisfied that everything looks good trim your tails leaving a 1/4” seam allowance, press (I usually finger press this small section) and sew down the binding over the “gap” that we left. Over lap your stitching by at least a 1/2” (where you previously attached the binding) so that you don’t leave any holes in your binding. Don’t forget to backstitch at the beginning and end. 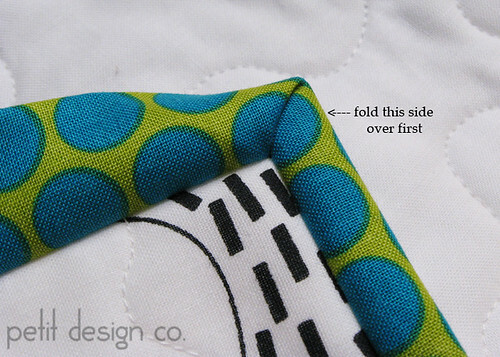 You should now have binding attached all the way around the back of your quilt. 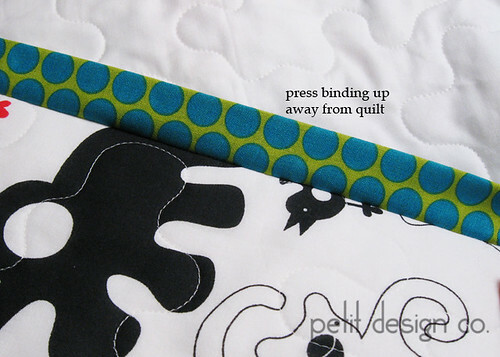 17) Press your binding up away from the quilt back. (I usually set my seam first.) All the way around the quilt. This will help with the next step so you don’t have to fight the binding very much. 18) Now we are ready to sew the binding to the front of the quilt. You can pick a thread that matches the binding (less visible) or use a contrasting color if you want your stitching to be visible. I used white on the animal quilt (pink is used in this following picture so you could see better.) Start anywhere on your quilt but at least 6-8” away from a corner to make things easier. Pull the binding over to the front so that it comes over far enough to cover your thread from stitching the binding to the back. 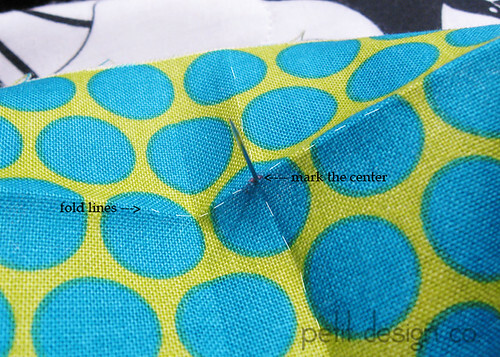 Align your needle so that you are sewing close to the loose edge of the binding. 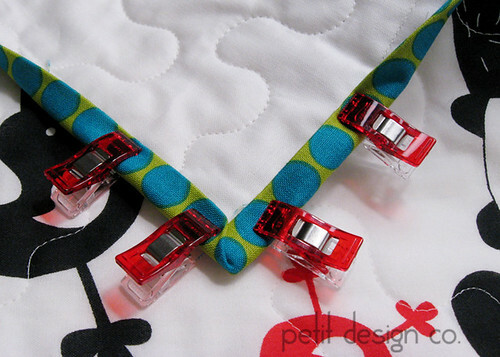 You can pin in place if you find it easier (I love these Clover Wonder Clips) I usually just use my fingers and pull the binding into place as I go. Except in the corners, there I use the Wonder Clips to give me an extra hand. Don’t forget to backstitch at the beginning, stitch until you near a corner and stop with your needle down. 19) When you near a corner you will have to get the corner ready for sewing. Start by folding over the side that is “tucked” under first. When you look at the binding from the back you will see that one side of the binding seems to be tuck under the other side. Then fold the other side over. Folding the sides over in order gives you a better chance of having your corners meet up nicely. 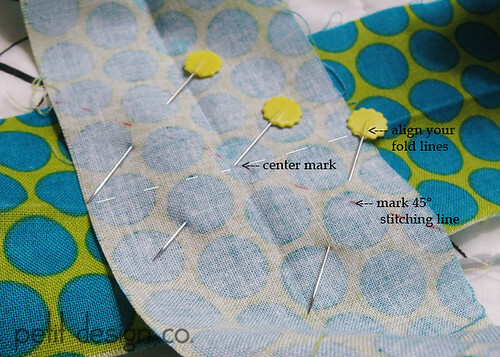 Use pins as needed to keep everything in place as you sew. I also like to use my angled tweezers to help everything get under the foot properly. Take your time on the corners. I usually go slow and find that I have to raise and lower my sewing foot to help the layers get under there in the right spot. To turn the corner, stop with your needle down, raise the walking foot, pivot the quilt, lower the walking foot and continue sewing. 20) Continue until you reach your starting point. I usually overlap my stitches by at least a 1/2” before backstitching and cutting my threads. I love ending up with pretty mitered corners. In the picture below you can see that two of my corners where perfect, while two were not. In instances like this I would go back and tack down the area where my stitching went off the binding by hand. 3-5 stitches by hand s far better (for me) than doing the binding by hand. I can finish binding a baby quilt in about an hour (not including making the binding) as opposed to hand stitching the binding in several hours. I didn’t take a picture of the back of the quilt after binding, but you will end up with a stitch line right next to, or pretty close to the binding. Keep that in mind when you choose a thread. 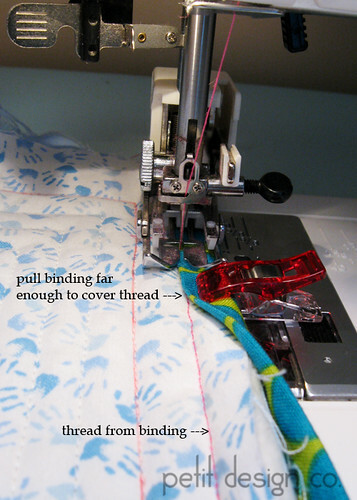 Do you do your binding by machine or do you prefer to hand stitch it down to the front? It has been fun having you along for the last 31 days! This is how I sew on most of my bindings. However, I don't sew the strips together like you showed in the pictures. I will give your method a try as it would create less bulk in one place. I have truly loved your quilting with a walking foot series. I will come back often and review your posts as I quilt my tops in the future. I like how it looks by hand but I don't like hand stitching a lot of binding, so I machine sew it. I usually use a zig zag stitch to sew it down on the front. I machine stitch my binding totally because I just don't have time to do it by hand. When I am joining the binding tails, I use a basting stitch on the machine first to be sure I have it right. Then -if it is right- I sew right over the basting stitches. BUT if it isn't right, then it is easy to pull out the basting stitches. I learned to do this after picking out a few that were wrong! i've machine stitched binding on small pieces using a zigzag. you make it look easy to straight line binding on ... will give it a try! thanx for all the finishing tutes ... a real learning experience! Thanks for a wonderful month! Today's tutorial is wonderful...your photography is also superb! I tried machine binding a mini quilt once, but it looked a state on the back, the stitching went on and off the binding and looked terrible - how do you prevent that? Thank you so much for the time and effort that you put into the 31 days series. I have shared with many friends the address of your blog to help them get over the fear of machine quilting and to show them all the options that exist without FMQ. Thanks again. Hi Norma, I just stumbled across your blog and THANK YOU! I'm fairly new to quilting and I'm always stumped as to how to quilt my quilt, and thanks to your awesome 31 days, I now have a huge amount of information for which design to choose! You have no idea how helpful it has been. Thank you, thank you, thank you. PS, as Judie Harron in the post above mentioned, a PDF with all this information would be awesome! I'm so glad I found this wonderful source of info! What's even better, I didn't have to wait! Thank you! I always handset my binding on the backside---shame on me...but I just like the look! I am about three months late starting this. We are having a snow day today so I read all 30 days at once. Your series was very well done and gave me several new ideas. Thank you. Very good tutorial, but I would like to add a few things. After I sew the bias seam to join the binding strips, I finger press the seam open. That make for less bulk, and less bulk is the reason for the bias seam in the first place. After the seam is pressed open, then trim the excess fabric. It's easier to open when there is more fabric to "grab" onto. I press a triangle into one end of the strip before I start, before I fold it in half. Iron well. Even starch it. That triangle will show you where to cut the binding at the end. 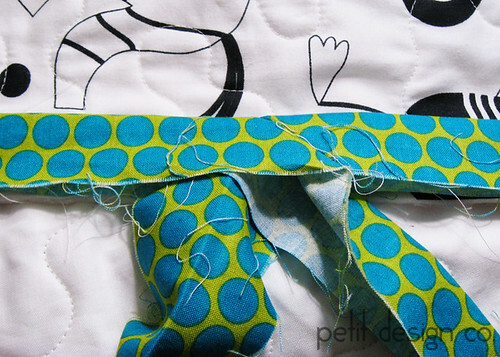 Lay and both ends on your quilt as you want them to be sewn down. Pin well. Cut off the the last end at the base of the triangle. Now the two binding ends will overlap just as far as they are wide. Open out both ends, place right sides together and twist so that you get the "L" shape as you had when sewing the other seams. Sew along that pressed line. Lay it on the quilt to see if it is right. If it didn't work, rip it and twist it the other way. If you do this wrong once you will get the hang of it. When it is right, finger press that seam open and trim seam allowance. 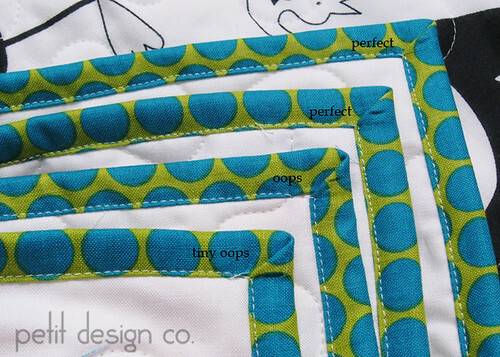 Now snap your binding back onto the quilt and sew that last few inches. Practice this on small things, and once you get it, you will be very happy with how easy this is. Thanks for your 31 days of machine quilting (not Free Motion). I can't get the hang of FMQ, so am always looking for ideas about how to machine quilt with my walking foot. As far as binding, most of my quilts have the binding hand sewn, but some are machine sewn. If I think that the quilt is going to have to stand up to a lot of washing, I will tend to machine sew the binding. Thank you so much for such a wonderful tutorial. Until now, I've never quite got the hang of bias joins. Now they look perfect!